Have you noticed any fear in practicing your Christian faith? Are there dangers in your mind that you have allowed to spread unchecked, overriding any peace you usually feel? If so, today is a great day to declare your independence from fear and refocus your faith. But how? Read Hidden in Dreams, by Davis Bunn. I just posted my review of this book, but I also wanted to give you a glimpse of what you could discover, by publishing a recent interview of the author, Davis Bunn. After reading his comments, you will quickly learn that he is a man of immense faith in God, who has managed to write fiction that appeals to Christians and non-Christians alike. And have one of his books turned into a movie! Davis Bunn is an award-winning novelist whose audience spans reading genres from high drama and action thrillers to heartwarming relationship stories, in both contemporary and historical settings. He and his wife, Isabella, make their home in Florida for some of each year, and spend the rest near Oxford, England, where they each teach and write. Visit Davis at www.davisbunn.com. Q: How much research did you have to conduct to write this intriguing story? A: In a way, I suppose you could say I’ve been researching this story all my adult life. I did my studies in international economics and finance. Observing the difficulties our nation and economy has faced over the past three years, as well as what we personally have endured, has been tough. It really was great to have this chance to give voice to what we increasingly hear, that the people at fault need to be brought to justice, and the risk of another economic collapse needs to be halted. Q: Why is it important for you to write about such timely themes? A: Economic uncertainty defines the world we live in. I feel it is important to show how the timeless and eternal messages are applicable to every aspect of our world and our lives. And how the gift of peace and wisdom can be used in every circumstance we face. 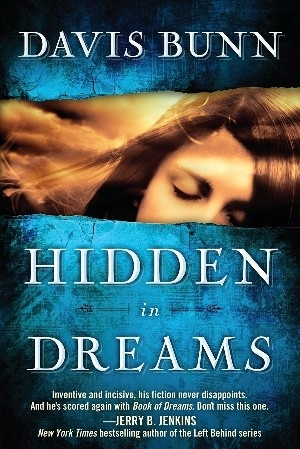 Q: When you wrote Book of Dreams, did you have plans for this sequel, Hidden in Dreams? A: Two months after Book of Dreams was released, I had the call every author dreams about and yearns for—a vice president of NBC/Universal suggested we discuss the possibility of turning it into a television series. I was put in touch with one of their producers and over the next six months began working up the basic structure of what this program might look like. One of the ideas I found most appealing became the basis for Hidden in Dreams. There is as yet no firm decision about the television project. But it has been a blast to even be considered. Q: In writing a sequel it’s always a challenge to include enough back story to satisfy those who haven’t read the first book while still making sure the book stands alone. How do you approach this dilemma? A: You’re right, it can indeed be troublesome, but this time it all fell together very easily. The structure just flowed. That sometimes happens, where the story seems to create itself. I wish it was true all the time. I can’t even say why it was such a smooth process with Hidden in Dreams. But there was a sense of impatience about the back story, as though I needed to fit in just a few paragraphs, but I couldn’t allow myself or the reader to be drawn too far from this new story’s flow. Q: Why did you choose to end Elena’s relationship with Antonio? They seemed like a good couple. A: For this story to work, Elena needed to enter into the dilemma as vulnerable as all the other people who shared the recurring dreams. She was isolated in a new place and forced to be dependent upon her faith and newfound friends. Antonio (from Book of Dreams) belonged to a different universe, far from what was happening here. I had to make a choice at the outset. Would she remain with Antonio, and the two of them experience this together? Or would she be isolated? Writing a new story is all about two things: facing the empty page, and choices. It is kind of fun to go back and revisit decisions I made eighteen months ago, when first outlining this concept. Q: You’re writing about two women in this novel. Is it ever a challenge to write from the female point of view? A: Learning to write from a woman’s point of view is very difficult for a male writer, as it usually is for a woman author writing a man’s story. Before I was published, I became friends with a husband and wife team who were both opera stars. The woman often sang a male role in a Mozart opera that was originally designed for a young boy, but which nowadays is usually sung by a woman with a slightly lower range, called a coloratura. I discussed my difficulty with her, of trying to make my women sound real. She told me that my trouble stemmed from working on a woman character from the outside. It wasn’t about making women ’sound’ anything. It was all about making the character live from the inside-out. As I worked on the point of view issue, trying to put my friend’s challenge into practice, I also began going into any meeting with a woman carrying a secret tape recorder, and taping everything that was said. I then went back and wrote out every word. It was perhaps the most boring month of my entire writing career. But gradually I found that I could ‘hear’ the speech patterns of these women, and reshape them into structures that fitted around what was happening in my stories. And through this exercise, the emotional content that lay behind the dialogue, the person who was expressing herself, became more real, more solid. And then I met my wife, Isabella. And the process of instruction at the intimate level of a God-centered marriage began to unfold. Q: In Hidden, Elena and her colleagues are attacked in Miami. After the attack, why did Elena not take more precautions? A: Elena had a choice to make, and so did I. Either she could play the delicate flower – fearing everything and going nowhere – or she could go on the hunt. I liked the balance between her internal fears and uncertainties, and her quest as a professional psychologist. She is, in effect, trained to look for clues – to go on the quest of drawing out the hidden. I felt the actions she took, despite the dangers, to be her natural response. Q: Is there another Elena Burroughs book planned? A: I have another idea. The question is, what do the readers want, and how positive is the reaction to this story? Q: Why do you write fiction? A: I became a believer at age 28. Up to that time, ever since graduating, I had been working in international business. I came to faith while working as a consultant in Germany. I started writing two weeks later. Up to that point, I had never picked up a pen in my life to write anything longer than a business report. But I had always been an avid reader. And the moment I started, that very first instant, I had the sense of invitation. It was the first time I had ever experienced that incredible sense of being drawn in a new, divinely inspired direction. I wrote for nine years and finished seven novels before my first was accepted for publication. Simply because I had received a sense of calling did not mean I was ready to serve. First the diamond had to be polished. Hard and painful as that was. Q: While you are a prolific writer, you also get out there and live too! What’s been your most exciting real life adventure? A: It would probably be better to ask, what has been the most exciting real-life event so far this year. Undoubtedly that would be working on the set of a film being shot from a screenplay I wrote last year. Unlimited has now ‘wrapped’, that is, filming has been completed. The producer and director are now deep into the editing process. The film is due for release in September, 2013. I am currently working on the novel, which comes out a couple of months before then. I had the whole thing backwards here, doing the script first, but it has been a lot of fun, and the concept remains very fresh. So hopefully Unlimited will come alive on the page as well as the screen. Q: What is your goal as a novelist? A: I want to combine a truly entertaining read with a powerful after-effect. My dream is that long after the book is set down with a satisfied sigh, there are still images that surface, lessons that can be drawn, genuine hope and healing and challenges and inspirations. I want my writing to be worthy of the gift. « When Fear Fuels Reality, is Faith Lost?